If you’re familiar with the Fulbright U.S. Student Program, you know Fulbright awards don’t grow on trees. In its rich academic history, Eastern Illinois University had seen exactly one student – nearly three decades ago – named a finalist for one of these ultra-prestigious Fulbright grants. But if you’re also familiar with Alison Stangel, you might not be terribly surprised to hear she is officially EIU’s second student to achieve such distinction; after applying in October, she made the cut as a semifinalist in January and two months later learned she had achieved the coveted finalist status. Stangel, set to graduate this fall with not one, but two, bachelor’s degrees after 4 ½ years at Eastern, is bound for Argentina next year as the recipient of that Fulbright ETA Award, where she’ll spend March-November assisting teachers who are learning to teach English. The personification of industriousness, Stangel will have needed just one extra semester to earn a BA in Foreign Languages (Spanish concentration) with a minor in French as well as a BA in Music with a minor in Jazz Studies. “It feels crazy sometimes,” admits Stangel, who also finds time for a number of extracurricular ventures as well as steady work over the years babysitting for music department faculty members. “Every night before I go to sleep, I plan out the next day by the hour. Christiane Eydt-Beebe, the current Department of Foreign Languages chair, outlined some of the ways Stangel has gone above and beyond as a student. 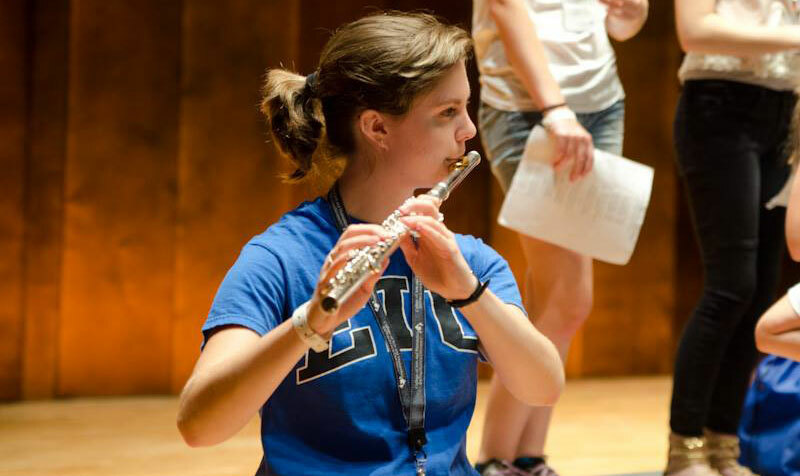 “(Alison) is currently learning an African flute piece as part of her creative project for the Francophone literature class,” said Dr. Eydt-Beebe. “The advanced technique she is learning mimics the sounds of a beating drum. She has also interpreted for various groups visiting the Doudna Fine Arts Center (in French, for a Cambodian group; in Spanish, for the Herencia musicians from South America who visited in Fall 2016). Oh, and Stangel is also in the process of learning German, a fourth language in a repertoire that already includes Spanish, French and, of course, English. “I just really like foreign languages,” laughed Stangel. “I know there are people who don’t have the wiring in their brain to learn another language, and I feel lucky to have that. I plan to keep learning more, because I can. Indeed, that interest in languages and foreign cultures is how the story of Stangel’s interest in becoming a Fulbright scholar began. During her freshman year, a conversation with Schmidt about studying abroad brought up the fact that she was considering joining the Peace Corps. Stangel kept that in the back of her mind for three years, which included a summer studying abroad in Spain and France and developing a real appreciation for the more relaxed – and open-minded – way of life in those European countries. 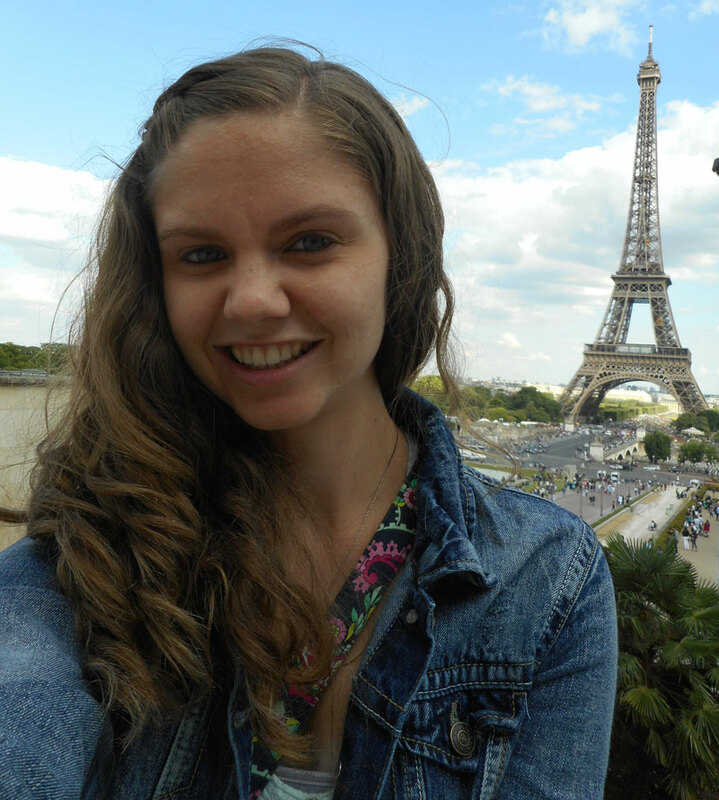 Late last summer, she went back to Schmidt to get started on the Fulbright application process. The written pieces included a personal statement, a “purpose of grant” statement, and an abstract of what Stangel intends to do while in Argentina. She was also required to provide three references as well as someone to vouch for her proficiency in Spanish, part of the requirements to complete her Fulbright program in Argentina. Additionally, Schmidt assembled a committee of faculty members who provided another level of screening for Stangel’s application materials and also met with her and wrote their own support for her candidacy. Schmidt says this particular offshoot of the Fulbright program includes opportunities in over 140 countries; for the 2016-17 academic year, approximately 3600 candidates from over 1600 colleges and universities were recommended. For that particular year, 1731 grants were awarded to students from 127 “top producing” institutions, including just two in Illinois: Knox College and Illinois College. “Regrettably, statistics are not yet available for the 2017-2018 grant competition, which is the one in which Alison competed,” added Schmidt. “Neither is a breakdown of applicants to selections for the English Teaching Assistantship (ETA) to Argentina for the immediately prior competition. The list of other schools producing Fulbright grant winners during that period is impressive: Brown; Colorado State; Emory; Georgetown; Hobart and William Smith; Kenyon College; Pitzer College; St. John’s; Siena College; Smith College; Wabash College; Whitman College; University of Michigan; University of Richmond; University of Utah. “It’s uncommon for institutions like ours to put forth a successful candidate in Fulbright competition,” added Schmidt. 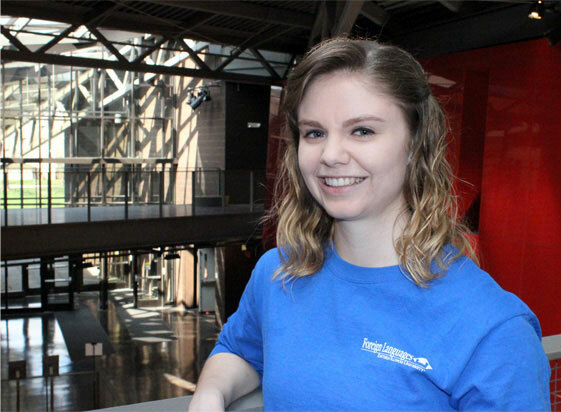 Stangel, whose future plans include grad school – perhaps somewhere in Colorado, which she spent Spring Break visiting with her boyfriend – and hopefully teaching at the university level, has certainly accomplished a lot in her time at Eastern. Most importantly, she’s enjoyed her time doing so. That professor was Dr. Rebecca Johnson, and she convinced Stangel and some other campers to give EIU a look.